Cities: Capital: Dhaka (pop. 10 million). Other cities — Chittagong (2.8 million), Khulna (1.8 million), Rajshahi (1 million). Nationality: Noun and adjective — Bangladeshi(s). Population (July 2009, CIA est. ): 156 million. Annual population growth rate (July 2009, CIA est. ): 1.29%. Health (CIA World Factbook): Infant mortality rate (below 1) — 59/1,000. Life expectancy — 60.25 years. Work force (70.86 million): Agriculture, forestry, and fisheries — 63%; manufacturing — 11%; mining and quarrying — 0.2%. Branches: Executive: president (chief of state), prime minister (head of government), cabinet. Legislative — unicameral Parliament (345 members). Judicial — civil court system based on British model. GDP (2008 est. ): $84.2 billion (official); $226.4 billion (PPP). Inflation (December 2008): 6.03% (point-to-point basis) and 8.9% (monthly average basis). Exchange rate: U.S. $1=69.03 BDT (Dec. 2009); U.S. $1=68.55 BDT (2008); U.S. $1=69.89 BDT (2007). Agriculture (19.1% of GDP): Products: rice, jute, tea, sugar, wheat. Industry (manufacturing; 28.6% of GDP): Types — garments and knitwear, jute goods, frozen fish and seafood, textiles, fertilizer, sugar, tea, leather, ship-breaking for scrap, pharmaceuticals, ceramic tableware, newsprint. Trade: Total imports (FY 2008): $21.6 billion: capital goods, food grains, petroleum, textiles, chemicals, vegetable oils. Growth rate over previous fiscal year: 25.95%. Total exports (FY 2008) — $14.11 billion: garments and knitwear, frozen fish, jute and jute goods, leather and leather products, tea, urea fertilizer, ceramic tableware. Growth rate over previous fiscal year: 16.04%. Exports to U.S. (Jan.-Dec. 2008) — $3.74 billion. Imports from U.S. (Jan.-Dec. 2008) — $468.1 million. 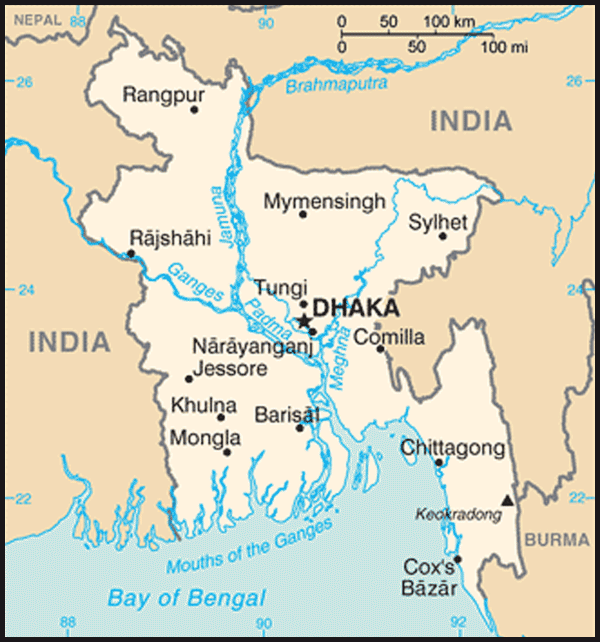 The area that is now Bangladesh has a rich historical and cultural past, combining Dravidian, Indo-Aryan, Mongol/Mughul, Arab, Persian, Turkic, and west European cultures. Residents of Bangladesh, about 98% of whom are ethnic Bengali and speak Bangla, are called Bangladeshis. Urdu-speaking, non-Bengali Muslims of Indian origin, and various tribal groups, mostly in the Chittagong Hill Tracts, comprise the remainder. Most Bangladeshis (about 83%) are Muslims, but Hindus constitute a sizable (16%) minority. There also are a small number of Buddhists, Christians, and animists. English is spoken in urban areas and among the educated. Bengal was absorbed into the Mughul Empire in the 16th century, and Dhaka, the seat of a nawab (the representative of the emperor), gained some importance as a provincial center. But it remained remote and thus a difficult to govern region — especially the section east of the Brahmaputra River — outside the mainstream of Mughul politics. Portuguese traders and missionaries were the first Europeans to reach Bengal in the latter part of the 15th century. They were followed by representatives of the Dutch, French, and British East India Companies. By the end of the 17th century, the British presence on the Indian subcontinent was centered in Calcutta. During the 18th and 19th centuries, the British gradually extended their commercial contacts and administrative control beyond Calcutta to Bengal. In 1859, the British Crown replaced the East India Company, extending British dominion from Bengal, which became a region of India, in the east to the Indus River in the west. When British India was partitioned and the independent dominions of India and Pakistan were created in 1947, the region of Bengal was divided along religious lines. The predominantly Muslim eastern half was designated East Pakistan — and made part of the newly independent Pakistan — while the predominantly Hindu western part became the Indian state of West Bengal. Pakistan's history from 1947 to 1971 was marked by political instability and economic difficulties. Dominion status was rejected in 1956 in favor of an "Islamic republic within the Commonwealth." Attempts at civilian political rule failed, and the government imposed martial law between 1958 and 1962, and again between 1969 and 1971. The crisis in East Pakistan produced new strains in Pakistan's troubled relations with India. The two nations had fought a war in 1965, mainly in the west, but the refugee pressure in India in the fall of 1971 produced new tensions in the east. Indian sympathies lay with East Pakistan, and in November, India intervened on the side of the Bangladeshis. On December 16, 1971, Pakistani forces surrendered, and Bangladesh — meaning "Bengal country" — was born; the new country became a parliamentary democracy under a 1972 constitution. The first government of the new nation of Bangladesh was formed in Dhaka with Justice Abu Sayeed Choudhury as President, and Sheikh Mujibur Rahman ("Mujib") — who was released from Pakistani prison in early 1972 — as Prime Minister. In May 1981, Zia was assassinated in Chittagong by dissident elements of the military. The attempted coup never spread beyond that city, and the major conspirators were either taken into custody or killed. In accordance with the constitution, Vice President Justice Abdus Sattar was sworn in as acting president. He declared a new national emergency and called for election of a new president within 6 months — an election Sattar won as the BNP's candidate. President Sattar sought to follow the policies of his predecessor and retained essentially the same cabinet, but the army stepped in once again. Army Chief of Staff Lt. Gen. H.M. Ershad assumed power in a bloodless coup in March 1982. Like his predecessors, Ershad suspended the constitution and — citing pervasive corruption, ineffectual government, and economic mismanagement — declared martial law. The following year, Ershad assumed the presidency, retaining his positions as army chief and CMLA. During most of 1984, Ershad sought the opposition parties' participation in local elections under martial law. The opposition's refusal to participate, however, forced Ershad to abandon these plans. Ershad sought public support for his regime in a national referendum on his leadership in March 1985. He won overwhelmingly, although turnout was small. Two months later, Ershad held elections for local council chairmen. Pro-government candidates won a majority of the posts, setting in motion the President's ambitious decentralization program. Political life was further liberalized in early 1986, and additional political rights, including the right to hold large public rallies, were restored. At the same time, the Jatiya (National) Party, designed as Ershad's political vehicle for the transition from martial law, was established. Despite a boycott by the BNP, led by President Zia's widow, Begum Khaleda Zia, parliamentary elections were held on schedule in May 1986. The Jatiya Party won a modest majority of the 300 elected seats in the National Assembly. The participation of the Awami League — led by the late President Mujib's daughter, Sheikh Hasina Wajed — lent the elections some credibility, despite widespread charges of voting irregularities. In February 2006, the AL returned to Parliament, demanded early elections, and requested significant changes in the electoral and caretaker government systems to stop alleged moves by the ruling coalition to rig the next election. The AL blamed the BNP for several high-profile attacks on opposition leaders and asserted the BNP was bent on eliminating Sheikh Hasina and the Awami League as a viable force. The BNP and its allies accused the AL of maligning Bangladesh at home and abroad out of jealousy over the government's performance on development and economic issues. Dialogue between the Secretaries General of the main ruling and opposition parties failed to sort out the electoral reform issues. The 13th Amendment to the constitution required the president to offer the position of the Chief Adviser to the immediate past Chief Justice of the Supreme Court, Justice K.M. Hasan, once the previous parliamentary session expired on October 28, 2006. The AL opposed Justice Hasan, alleging that he belonged to the ruling BNP in the past and that the BNP government in 2004 amended the constitution to extend the retirement age for the Supreme Court judges to ensure Justice Hasan became the Chief Adviser to help BNP win the elections. Justice Hasan declined the position, and after 2 days of violent protests, President Iajuddin Ahmed also assumed the role of Chief Adviser to the caretaker government. On July 16, 2007 the government arrested Awami League president and former Prime Minister Sheikh Hasina on charges of extortion during her tenure as Prime Minister. Hasina was released on parole in June 2008 and allowed to travel to the United States for medical treatment. The cases against her continue. On September 3, 2007, the government arrested BNP chairperson and former Prime Minister Khaleda Zia on charges of corruption. Sheikh Hasina returned from abroad and Khaleda Zia was released from prison to lead their respective parties in the parliamentary election campaign in the fall of 2008. Municipal elections were held in 13 city corporations and municipalities on August 4, 2008. These elections were judged free and fair by international and domestic observers. The Election Commission registered over 80 million voters in preparation for parliamentary elections, which were held December 29, 2008. The Awami League swept to a landslide victory in what domestic and international observers declared a free, fair and credible election. The caretaker government ended on January 6, 2009 when Awami League President Sheikh Hasina became Prime Minister. Prime Minister Sheikh Hasina appointed a cabinet of relative newcomers upon taking office in January 2009. The BNP-led opposition attended the opening of the Parliament session, but has since mounted several boycotts in protest of perceived slights by the ruling party. Both sides struggle to break free from their shared history of confrontational politics, and key institutions necessary for strengthening democracy remain weak. As the new government was settling into office, it was rocked by a mutiny by border guards on February 25-26, 2009 in which more than 50 army officers were murdered. Prime Minister Hasina has sought to increase Bangladesh's presence on the world stage. As leader of one of the countries most vulnerable to climate change, Hasina has been a vocal advocate for mitigation and adaptation by both developed and developing countries, aligning with the Copenhagen Accord in January 2010. In a sharp change from previous administrations, her government has actively confronted violent extremist groups to deny space to terrorist networks and activities within its borders. The simultaneous elections of the Awami League and the Congress Party in India set the stage for renewed bilateral talks between the countries, an atmosphere which has been improved by counterterrorism cooperation. In January 2010, Hasina traveled to New Delhi to meet with Indian Prime Minister Singh, where they signed three agreements on mutual legal assistance in criminal matters, transfer of sentenced persons, and countering terrorism, organized crime, and illegal drug trafficking; and two memoranda of understanding on energy sharing and cultural exchange programs. The legislature is a unicameral, 300-seat body. All of its members are elected by universal suffrage at least every 5 years. Parliament amended the constitution in May 2004, making a provision for 45 seats reserved for women to be distributed among political parties in proportion to their numerical strength in Parliament. Several women's groups have demanded direct election to fill the reserved seats for women. Bangladesh maintains an embassy (http://www.bdembassyusa.org/) in the United States at 3510 International Drive NW, Washington, DC 20008 (tel: 202-244-0183; fax: 202-244-5366). Bangladesh has Consulates General in New York and Los Angeles. Despite serious problems related to a dysfunctional political system, weak governance, and pervasive corruption, Bangladesh remains one of the few democracies in the Muslim world. Bangladeshis regard democracy as an important legacy of their bloody war for independence, and they vote in large numbers. However, democratic institutions and practices remain weak. Bangladesh is generally a force for moderation in international forums, and it is also a long-time leader in international peacekeeping operations. It has been the second-largest contributor to UN peacekeeping operations, with 10,481 troops and police active in November 2009. Its activities in international organizations, with other governments, and with its regional partners to promote human rights, democracy, and free markets are coordinated and high-profile. Bangladesh became a member of the United Nations Human Rights Council in May 2006, and began a second term in 2009. However, an explicit goal of its foreign policy has been to strengthen relations with Islamic states, leading to actions such as voting against a December 2009 UN resolution to improve human rights conditions in Iran. Bangladesh lies at the strategic crossroads of South and Southeast Asia. Potential terrorist movements and activities in or through Bangladesh pose a potentially serious threat to India, Nepal, Bhutan, and Burma, as well as Bangladesh itself. Consequentially, the Bangladesh Government has banned a number of Islamic extremist groups in recent years. In February 2002, the government banned Shahdat al Hiqma, in February 2005 it banned Jagrata Muslim Janata, Bangladesh (JMJB) and Jama'atul Mujahideen Bangladesh (JMB), and in October 2005 it banned Harkatul Jehad Al Islami (HUJI). Following the August 17, 2005 serial bombings in the country, the government launched a crackdown on extremists. In 2006, seven senior JMB leaders were sentenced to death for their role in the 2005 murder of two judges. Six of the seven were executed in March 2007; another leader was tried and sentenced to death in absentia in the same case. In March 2008, the U.S. Government listed Harkatul Jihadi Islami (HUJI)-Bangladesh as a foreign terrorist organization. In October 2009, the Government of Bangladesh added Hizb-ut-Tahrir to the list of banned terrorist organizations. Given its size and location, a major crisis in Bangladesh could have important consequences for regional stability, particularly if significant refugee movements ensue. Since independence in 1971, Bangladesh has received more than $30 billion in grant aid and loan commitments from foreign donors, about $15 billion of which has been disbursed. Major donors include the World Bank, the Asian Development Bank, the UN Development Program, the United States, Japan, Saudi Arabia, and west European countries. Bangladesh historically has run a large trade deficit, financed largely through aid receipts and remittances from workers overseas. Foreign reserves dropped markedly in 2001 but stabilized in the $3 billion to $4 billion range (or about 3 months' import cover). In January 2007, reserves stood at $3.74 billion, and they increased to $5.39 billion by January 2008, according to the Bank of Bangladesh, the central bank. As of FY 2009, Bangladesh's economy was weathering the global economic crisis, growing some 5.9%. Exports dipped slightly, but the decrease was modest compared to other developing nations. Remittances from overseas workers remained strong, though it was thought that growth in remittances could slow following an apparent slowdown in the numbers of Bangladesh workers going abroad. The United States is Bangladesh's third-largest export market, with trade between the two nations reaching $4.2 billion in 2009. The economy was predicted to grow near 6% in 2010. Following the violent events of 1971 during the fight for independence, Bangladesh — with the help of large infusions of donor relief and development aid — slowly began to turn its attention to developing new industrial capacity and rehabilitating its economy. The static economic model adopted by its early leadership, however — including the nationalization of much of the industrial sector — resulted in inefficiency and economic stagnation. Beginning in late 1975, the government gradually gave greater scope to private sector participation in the economy, a pattern that has continued. A few state-owned enterprises have been privatized, but many, including major portions of the banking and jute sectors, remain under government control. Population growth, inefficiency in the public sector, resistance to developing the country's richest natural resources, and limited capital have all continued to restrict economic growth. Efforts to achieve Bangladesh's macroeconomic goals have been problematic. The privatization of public sector industries has proceeded at a slow pace — due in part to worker unrest in affected industries — although on June 30, 2002, the government took a bold step as it closed down the Adamjee Jute Mill, the country's largest and most costly state-owned enterprise. The government also has proven unable to resist demands for wage hikes in government-owned industries. Access to capital is impeded. State-owned banks, which control about three-fourths of deposits and loans, carry classified loan burdens of about 50%. The IMF and World Bank predicted GDP growth over 2010-2015 of about 6.0%, well short of the 8%-9% needed to lift Bangladesh out of its severe poverty. The initial impact of the end of quotas under the Multi-Fiber Arrangement has been positive for Bangladesh, with continuing investment in the ready-made garment sector, which has experienced annual export growth of around 20%. Downward price pressure means Bangladesh must continue to cut final delivered costs if it is to remain competitive in the world market. Foreign investors in a broad range of sectors have been increasingly frustrated with the politics of confrontation, the level of corruption, and the slow pace of reform. Investors viewed favorably steps taken by the interim government to address corruption, governance, and infrastructure issues, though most believed it was too early to assess the long-term impact of those developments. With the reemergence of Sheikh Hasina in a position of political leadership, and her subsequent interest in international outreach, opportunities to build upon U.S.-Bangladesh economic cooperation exist. For prospective economic cooperation to be further realized, Bangladesh must address its market shortcomings and vulnerabilities in a timely manner. Fortunately for Bangladesh, many new jobs — 1.8 million, mostly for women — have been created by the country's dynamic private ready-made garment industry, which grew at double-digit rates through most of the 1990s. The labor-intensive process of ship-breaking for scrap has developed to the point where it now meets most of Bangladesh's domestic steel needs. Other industries include sugar, tea, leather goods, newsprint, pharmaceutical, and fertilizer production. The country has done less well, however, in expanding its export base — garments account for more than three-fourths of all exports, dwarfing the country's historic cash crop, jute, along with leather, shrimp, pharmaceuticals, and ceramics. The Bangladesh Army, Navy, and Air Force are composed of volunteer military members. In addition to traditional defense roles, the military is frequently called on to provide support to civil authorities for disaster relief and internal security. During the period of emergency rule from January 2007 to December 2008, the military played a central role in the formulation and execution of key government strategies, including the anti-corruption campaign and voter registration. The army is modeled and organized along British lines, similar to other armies on the Indian subcontinent. However, the army is attempting to adopt U.S. Army tactical planning procedures, training management techniques, and noncommissioned officer educational systems. The Bangladesh military continues to improve its peacekeeping operations capabilities and receives such training from the U.S. military, UN, and other nations. The United States provided the Bangladesh Air Force four U.S. C-130 B transport aircraft in 2001 under the Excess Defense Article (EDA) program. These aircraft have improved the military's disaster response and peacekeeping capabilities. The Bangladesh Navy is mostly limited to coastal patrolling within the Bay of Bengal and participates in international exercises. A Coast Guard exists under the Ministry of Home Affairs (MOHA) to address anti-smuggling, anti-piracy, and protection of offshore resources. The Bangladesh Rifles (BDR), also under the MOHA, addresses anti-smuggling and other missions along the land border. With 10,481 peacekeepers deployed around the world as of November 2009, Bangladesh has been the second-largest troop contributor to international peacekeeping operations. Bangladesh was admitted to the United Nations in 1974 and was elected to a Security Council term in 1978 and again for a 2000-2001 term. The country's foreign minister served as president of the 41st UN General Assembly in 1986. The government has participated in numerous international conferences, especially those dealing with population, food, development, and women's issues. In 1982-83, Bangladesh played a constructive role as chair of the "Group of 77," an informal association encompassing most of the world's developing nations. It has taken a leading role in the "Group of 48" developing countries and the "Developing-8" group of countries. It is also a participant in the activities of the Non-Aligned Movement. Since 1975, Bangladesh has sought close relations with other Islamic states and a role among moderate members of the Organization of Islamic Cooperation (OIC). In 1983, Bangladesh hosted the foreign ministers meeting of the OIC. The government also has pursued the expansion of cooperation among the nations of South Asia, bringing the process — an initiative of former President Ziaur Rahman — through its earliest, most tentative stages to the formal inauguration of the South Asian Association for Regional Cooperation (SAARC) at a summit gathering of South Asian leaders in Dhaka in December 1985. Bangladesh hosted the SAARC summit in November 2005, and Prime Minister Khaleda Zia reassumed its chairmanship. Bangladesh has participated in a wide range of ongoing SAARC regional activities. The head of the then-caretaker government participated in the April 2007 SAARC summit in India. In recent years, Bangladesh has played a significant role in international peacekeeping activities. Over 10,000 Bangladeshi military personnel were deployed overseas on peacekeeping operations as of November 2009. Under UN auspices, Bangladeshi troops have served or are serving in Sierra Leone, Somalia, Rwanda, Mozambique, Kuwait, Ethiopia/Eritrea, Kosovo, Timor-Leste, Georgia, Congo, Cote d'Ivoire, Western Sahara, Bosnia, and Haiti. Bangladesh responded quickly to President Bill Clinton's 1994 request for troops and police for the multinational force for Haiti and provided the largest non-U.S. contingent. Indo-Bangladesh relations are often strained, and many Bangladeshis feel India likes to play "big brother" to smaller neighbors, including Bangladesh. Bilateral relations warmed in 1996, due to a softer Indian foreign policy and the new Awami League government. A 30-year water-sharing agreement for the Ganges River was signed in December 1996, after an earlier bilateral water-sharing agreement for the Ganges River lapsed in 1988. Bangladesh remains extremely concerned about a proposed Indian river linking project, which the government says could turn large parts of Bangladesh into a desert. The Bangladesh Government and tribal insurgents signed a peace accord in December 1997, which allowed for the return of tribal refugees who had fled into India, beginning in 1986, to escape violence caused by an insurgency in their homeland in the Chittagong Hill Tracts. The implementation of most parts of this agreement has stalled, and the army maintains a strong presence in the Hill Tracts. Arms smuggling and reported opium poppy cultivation are concerns in this area. Occasional skirmishes between Bangladeshi and Indian border forces sometimes escalate and seriously disrupt bilateral relations. Much to Bangladesh's displeasure, India has erected a barbed-wire fence on part of its border with Bangladesh to prevent alleged illegal migration of Bangladeshis into India. The BNP and other political parties view the Indian Government as a major benefactor of the Awami League and blame negative international media coverage of Bangladesh on alleged Indian manipulation. Former Prime Minister Khaleda Zia, however, visited the Indian capital in March 2006 and reviewed bilateral relations with her Indian counterpart. Two agreements — the Revised Trade Agreement and the Agreement on Mutual Cooperation for Preventing Illicit Drug Trafficking in Narcotic Drugs and Psychotropic Substances and Related Matters — were signed between the two countries during this visit. Indian Foreign Minister Pranab Mukherjee met with the Chief Adviser in Dhaka on February 26, 2007. Mukherjee invited Ahmed to the April 3-4, 2007, SAARC summit in Delhi, and both sides pledged to put Bangladesh-India relations on "an irreversible higher trajectory." Mukherjee again visited Bangladesh after Cyclone Sidr hit the southwestern coastal districts on November 15, 2007 and offered help to rebuild 10 of the devastated villages. Bangladesh Army Chief General Moeen U. Ahmed paid a 6-day visit to India beginning late February 2008 at the invitation of his Indian counterpart. He met with Mukherjee and the Chief Minister of West Bengal province, besides meeting military officials. During this visit, Ahmed announced that passenger trains could start running between Dhaka and Kolkata by April 14. After the return of the Awami League government in January 2009, Prime Minister Hasina made it clear that improved relations with India would be a priority for her government. Foreign Minister Dipu Moni traveled to New Delhi in September 2009 to begin bilateral discussions. Prime Minister Hasina herself traveled to New Delhi in January 2010 to meet with Indian Prime Minister Singh, where they signed several agreements designed to further strengthen their bilateral relationship. Pakistan. Bangladesh's complicated relationship with Pakistan reflects the legacy of their shared history and the independence struggle. Landmarks in their reconciliation are:An August 1973 agreement between Bangladesh and Pakistan on the repatriation of numerous individuals, including 90,000 Pakistani prisoners of war stranded in Bangladesh as a result of the 1971 conflict;A February 1974 accord by Bangladesh and Pakistan on mutual recognition followed more than 2 years later by establishment of formal diplomatic relations;The organization by the UN High Commissioner for Refugees (UNHCR) of an airlift that moved almost 250,000 Bengalis from Pakistan to Bangladesh, and non-Bengalis from Bangladesh to Pakistan; andExchanges of high-level visits, including a visit by Prime Minister Benazir Bhutto to Bangladesh in 1989 and visits by Prime Minister Zia to Pakistan in 1992 and in 1995.President Pervez Musharraf visited Bangladesh in 2002.Prime Minister Shaukat Aziz visited Bangladesh in 2004.Prime Minister Khaleda Zia visited Pakistan in 2006. Still to be resolved are the division of assets from the pre-1971 period and the status of more than 250,000 non-Bengali Muslims (known as "Biharis") remaining in Bangladesh but seeking resettlement in Pakistan. Since the Awami League government took office in January 2009, relations have been strained over the issue of trials of war criminals from the 1971 war for independence. Burma. Bilateral ties with Burma are good, despite occasional border strains and an influx of more than 270,000 Muslim refugees (known as "Rohingya") from predominantly Buddhist Burma. As of June 2011, there were over 29,000 refugees officially registered in camps in southern Bangladesh. Thousands of other Burmese, not officially registered as refugees, are squatting on the bank of the river Naaf or living in Bangladeshi villages in the southeastern tip of the country. Bangladesh and Burmese officials have held negotiations on establishing a road link between the capitals of the two countries. In 1989, the U.S.S.R. ranked 14th among aid donors to Bangladesh. The Soviets focused on the development of electrical power, natural gas and oil, and maintained active cultural relations with Bangladesh. They financed the Ghorasal thermal power station — the largest in Bangladesh. Russia conducted an aggressive military sales effort in Dhaka and won a $124-million deal for eight MIG-29 fighters. Bangladesh began to open diplomatic relations with the newly independent Central Asian states in 1992. Bangladesh has signed an agreement with Russia for the construction of a nuclear power plant, and Foreign Minister Dipu Moni visited Moscow in May 2010. Since that time, relations have grown stronger, centering on trade, cultural activities, military and civilian aid, and exchanges of high-level visits, beginning in January 1977 with President Zia's trip to Beijing. The largest and most visible symbol of bilateral amity is the Bangladesh-China "Friendship Bridge," completed in 1989 near Dhaka, as well as extensive military hardware in the Bangladesh inventory and warm military relations between the two countries. In the 1990s, the Chinese also built two 210-megawatt power plants outside of Chittagong; mechanical faults in the plants cause them to shut down frequently for days at a time, heightening the country's power shortage. The opening of a Taiwanese trade center in Dhaka in 2004 displeased China, but the Bangladesh Government moved quickly to repair the rift and closed the trade center. In April 2005, Bangladesh and China signed nine memoranda of understanding on trade and other issues during the visit to Dhaka of Prime Minister Wen Jiabao. In August 2005, former Prime Minister Khaleda Zia visited China. In March 2010, Prime Minister Hasina visited China, in an effort to strengthen the countries' diplomatic ties and discuss regional and global issues. Bangladesh agreed to continue its embrace of a "one China" policy, and China in return pledged significant development aid to Bangladesh. China also agreed to provide financing for several new infrastructure projects in Bangladesh. Other countries in South Asia. 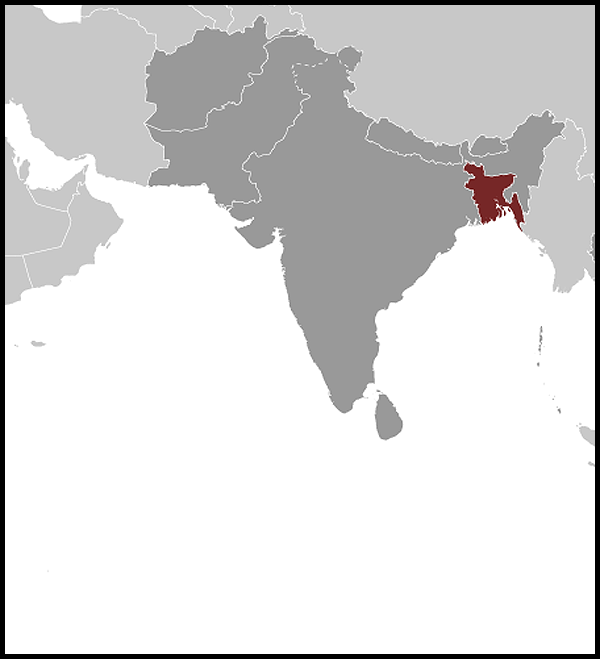 Bangladesh maintains friendly relations with Bhutan, Maldives, Nepal, and Sri Lanka and strongly opposed the Soviet invasion of Afghanistan. Bangladesh has cordial relations with the government of Afghan President Hamid Karzai, and Bangladeshi non-governmental organizations (NGOs) are active in Afghan reconstruction efforts. Bangladesh and Nepal agreed to facilitate land transit between the two countries. Bangladesh has explored importing electricity from Bhutan through India to meet its energy shortfall. U.S.-Bangladesh relations are excellent. These relations were boosted in March 2000 when President Clinton visited Bangladesh, the first-ever visit by a sitting U.S. President, when Secretary of State Colin Powell visited in June 2003, as well as when Secretary of Defense Donald Rumsfeld visited in June 2004. A centerpiece of the bilateral relationship is a large U.S. aid program, totaling about $163 million for 2009. U.S. economic and food aid programs, which began as emergency relief following the 1971 war for independence, now concentrate on long-term development. U.S. assistance objectives include stabilizing population growth, protecting human health, encouraging broad-based economic growth, and building democracy. In total, the United States has provided more than $5.5 billion in food and development assistance to Bangladesh. Food aid under Titles I, II, and III of PL-480 (congressional "food-for-peace" legislation) has been designed to help Bangladesh meet minimum food requirements, promote food production, and moderate fluctuation in consumer prices. Other U.S. development assistance emphasizes family planning and health, agricultural development, and rural employment. The United States works with other donors and the Bangladesh Government to avoid duplication and ensure that resources are used to maximum benefit. Since 1986, with the exception of 1988-89, when an aircraft purchase made the trade balance even, the U.S. trade balance with Bangladesh has been negative, due largely to growing imports of ready-made garments. Jute carpet backing is the other major U.S. import from Bangladesh. Total imports from Bangladesh were about $2.6 billion (excluding services) in FY 2005, up from $2.1 billion in 2002. In 2007 total imports reached $3.4 billion. U.S. exports to Bangladesh (some $333 million — excluding services — in 2005, and $456 million in 2007) include wheat, fertilizer, cotton, communications equipment, aircraft, and medical supplies, a portion of which is financed by the U.S. Agency for International Development (USAID). A bilateral investment treaty was signed in 1989. Relations between Bangladesh and the United States were further strengthened by the participation of Bangladesh troops in the 1991 Gulf war coalition, and alongside U.S. forces in numerous UN peacekeeping operations, including Haiti in 1994, as well as by the assistance of a U.S. naval task force after a disastrous March 1991 cyclone in Bangladesh. The relief efforts of U.S. troops are credited with having saved as many as 200,000 lives. In response to Bangladesh's worst flooding of the century in 1998, the United States donated 700,000 metric tons of food grains, helping to mitigate shortages. In July 2006, the U.S. Navy's hospital ship Mercy visited Bangladesh and U.S. personnel worked with Bangladeshi medical personnel to provide medical treatment to Bangladeshi patients. Between 2005 and 2008, the United States obligated $2.2 million in grant aid funding (Foreign Military Financing) to purchase Defender class small boats for the Coast Guard of Bangladesh, and allocated $934,000 in IMET (International Military Education and Training) for 2007. In addition to heavy flooding at the end of summer 2007, Cyclone Sidr hit the country on November 15, causing widespread devastation and affecting the lives of millions of people. Following the cyclone, U.S. troops and two U.S. naval vessels assisted in the delivery of relief supplies to cyclone victims. USAID provided approximately $36.5 million in food and relief items to Cyclone Sidr-affected people and has continued its support through rebuilding houses for people in the cyclone-affected areas. An additional $80 million will be provided to rebuild livelihoods, strengthen local government, generate economic recovery through income-generation activities, and to plan and construct cyclone shelters in the disaster-prone areas. Additionally, Bangladesh has become a valuable United States ally in global efforts to defeat terrorism. As part of these efforts, the Government of Bangladesh has begun to address problems of money laundering and weak border controls to ensure that Bangladesh does not become a terrorist safe-haven. Despite porous borders, ungoverned spaces, and poor service delivery, Bangladesh's strong national identity and moderate Islamic tradition help it serve as a key player in combating extremism. USAID is the principal U.S. Government agency providing development assistance in Bangladesh. USAID has had a full-fledged cooperation program in Bangladesh since 1971. It works closely with the Government of Bangladesh, non-governmental organizations, the private sector, and other donors. USAID's yearly development budget for Bangladesh averages $100 million. In 2009, planned assistance amounted to roughly $163 million, including help for people living in the Cyclone Sidr-affected regions. Since 1971, USAID has provided over $5.5 billion in development assistance, with half of that amount provided in food aid. With USAID assistance, Bangladesh has seen significant improvements in living conditions. Today, Bangladeshis have better access to health care and electricity, increased agricultural productivity and better nutrition. USAID works with communities in disaster preparedness and to improve their ability to manage emergency food supplies. USAID programs assist Bangladeshi organizations and communities in addressing their needs in the areas of health and family planning, income generation, agriculture and food security, disaster management, democracy and human rights, and education. Investing in People: Health and Education. USAID supports the provision of low-cost, quality family planning services, maternal and child health care, and treatment for tuberculosis through a network of nongovernmental clinics and community health workers. USAID promotes the social marketing of contraceptives and selected maternal and child health products through private sector outlets. USAID-supported programs serve 38% of all couples using modern family planning methods. In 2008, USAID programs provided 1 million pregnancy-related checkups, vaccinations for 300,000 children, and essential care for 40,000 newborns. USAID targets the most at-risk populations with messages about the treatment of sexually transmitted infections. Although enrollment in primary school has improved in recent years, an estimated 40% of children still do not complete the second grade. USAID's pioneering work in early childhood education, including its support for 1,800 preschools and learning programs for older children, improves schools' ability to address poor attendance, low achievement, and high dropout rates in primary school. The USAID-funded Sesame Street television program "Sisimpur" is the most widely viewed children's television program in Bangladesh, reaching over 9 million viewers weekly. Humanitarian Assistance: Improving Disaster Response. Bangladesh is highly vulnerable to natural disasters, including cyclones, floods, landslides, droughts, and earthquakes. USAID's food security, disaster readiness, and humanitarian assistance programs target 3,500 of the most at-risk villages and help to provide a safety net of short-term emergency assistance during natural disasters, as well as long-term solutions that raise incomes, improve health, and enhance food security. Since 2005, USAID has financed various asset protection activities, such as raising the ground of rural homes for 4,400 vulnerable farming households to protect assets such as vegetable gardens and farming animals. USAID has funded the construction of earthen embankments, which protect crops and allow more time to harvest, and walls to stop erosion in low-lying areas. In 11 southern coastal districts impacted by Cyclone Sidr, USAID plans to build 100 schools that will serve as shelters in the event of a disaster. Increasing Economic Growth. USAID's most significant contribution in Bangladesh has been to help bring electricity to rural areas. In 1971, only 3% of the population had electricity; today, 44% do. To protect natural resources and empower local people who depend on them for their livelihoods, USAID works with communities to establish management systems that encourage the wise use of aquatic and tropical forest resources and restore habitats and ecosystems. USAID also expands access to global markets by assisting key sectors, such as aquaculture and horticulture, to improve the quality of their products, increase sales, create jobs, and promote investment, particularly for the benefit of women, youth, and small and medium enterprise suppliers. Governing Justly and Democratically. Elected officials and public institutions frequently fail to effectively address citizens' needs, and large- and small-scale corruption is pervasive. To fight these trends, USAID addresses the root causes of corruption by improving the quality of governance by elected leaders, developing fair and open election processes, improving the functioning of political parties, and increasing parliamentary and citizen oversight of the national budget. USAID also works with nongovernmental organizations, local governments, and municipal associations to improve government accountability and the delivery of social services. These efforts have led to direct budget allocations from the national government to local government associations for the first time ever. In addition, these programs have achieved a 50% increase in local revenues in targeted areas. Peace and Security: Combating Human Trafficking. Trafficking in persons is a significant transnational crime in Bangladesh. With USAID's support, the Bangladesh Government made significant progress in dealing with human trafficking, removing the country from prospective U.S. sanctions. USAID has provided assistance to more than 500 trafficking survivors since 2006. The United States and Bangladesh have been friends and close allies for many years. Through its development assistance programs, the U.S. Government will continue to be a strong and close partner of the Bangladeshi people. The U.S. Embassy (http://dhaka.usembassy.gov/) in Dhaka is located at Madani Avenue, Baridhara, Dhaka 1212, Bangladesh; tel: (880) (2) 885-5500, fax: (880) (2) 8823744. Hours of Operation: Sunday to Thursday (08:00 a.m.-16:30 p.m.), except holidays.